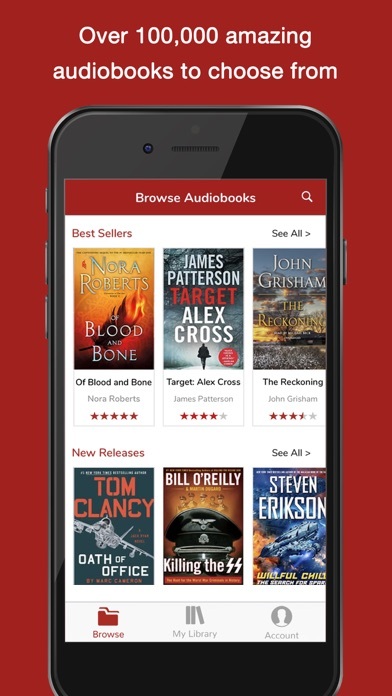 Download or steam over 100,000 amazing audiobooks on the go! Start listening to bestselling titles in fiction and non-fiction in seconds. There is also unlimited access to 1000's of free audiobooks! WHY AUDIOBOOKSNOW IS DIFFERENT 1. Save on every audiobook you purchase. 2. Save big with our Club Pricing Plan or purchase at our everyday low prices (no plan required). 3. We do not use gimmicky credits to hide the true costs. 4. Free rewards program that earns points on nearly every dollar spent. 5. Weekly specials and sales on fiction and non-fiction audiobooks. There are many ways to enjoy audible spoken word audio books. Whether you're on a road trip, long commute, working out, or simply doing chores around the house, audio books are the perfect way to enjoy great books anytime, anywhere. Audiobooks are also perfect for anyone who is vision impaired. 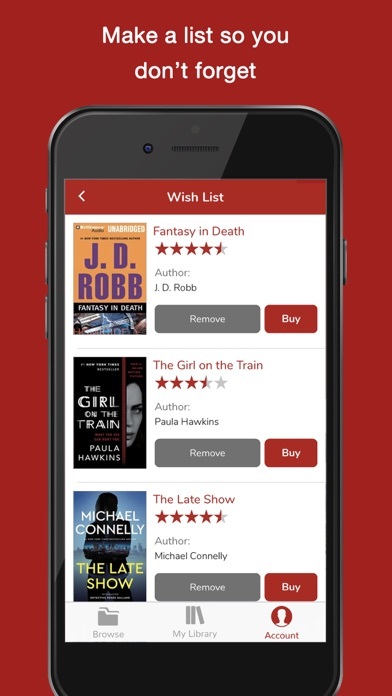 FEATURES YOU’LL LOVE • Download audio books for offline listening. • Stream them to save space. 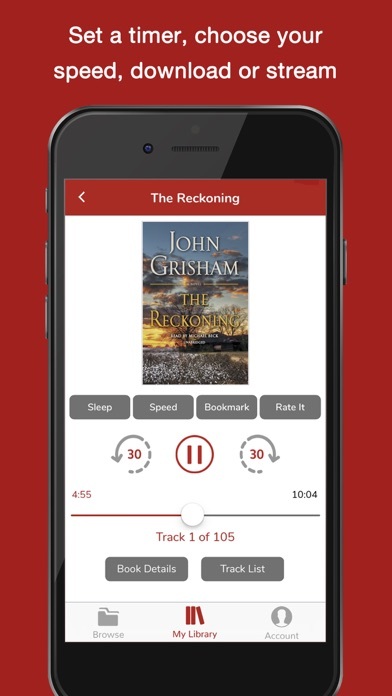 • Audiobooks and bookmarks automatically sync across multiple devices. • Change the playback speed • Set a sleep timer Talking books are a great way to keep up with your reading when you’re busy. 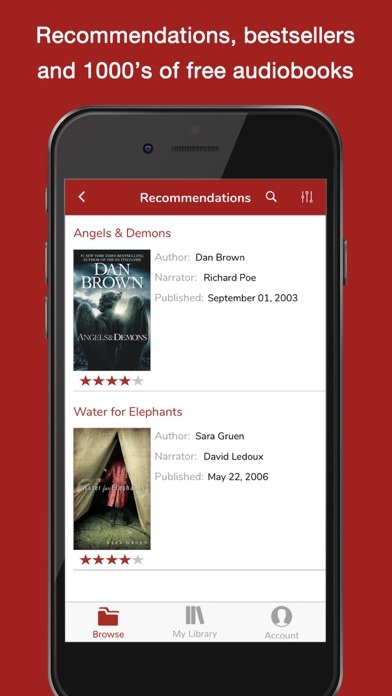 Whatever your interests are you'll find the perfect listen at AudiobooksNow. We pride ourselves on a great selection, low prices, and outstanding customer service. 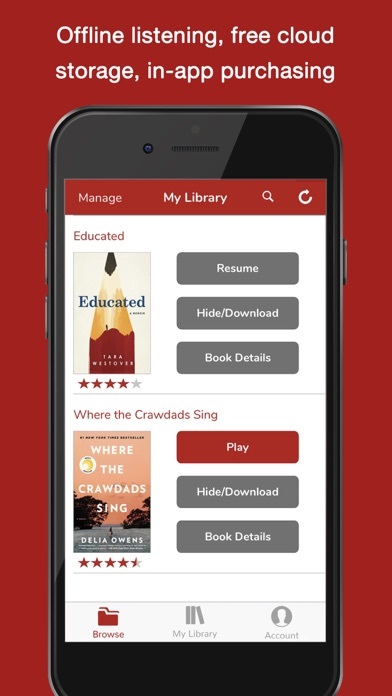 Download the free AudiobooksNow app today and start listening and saving! I'm on the Club Pricing plan, and overall this app works. + I like that it's mostly DRM free, so I could put the files into Music or another app, but I prefer to use this one. + Had multiple speedup options for playback (1.25x, 1.5x, etc.). Saves a lot of time. - Ugly, unresponsive web app. Come on, build a native app already. - Still needs an internet connection to play already downloaded books. Makes it useless on an airplane. - Sometimes tracks break at set intervals, not at logical places in the book like chapters or headings. Many times I'll want to go back a couple of minutes and find I can't because we started a new track. You can't back up 30 seconds into the previous track. You have to manually select it from the track list and find your place again. I got charged for something and I have proof on my card statement and proof from iTunes/apple and I have no idea what was purchased but I clearly do not have a book, audiobook or membership! I want my money returned! I literally do not have anything in my “library”. I will take this to small claims if I have to. Rewind and fast forward can be done only by 30 secs which is too long. Non-intuitive interface. Does not save your place in the audiobook. Requires you to enter an email, Which means this is used to scrape personal information. Generally one of the poorest app experiences I’ve ever had. And yes I have the most recent version, and the most up-to-date OS. I was eager to read my sample audiobook, and I’m so frustrated by the app that I’ve just given up even though it’s not available anywhere else. The streaming playback routinely loses its spot and then will skip to the next chapter. After I finish the one book I bought through this company, I’m switching to audible. More expensive, but I got this for my drive and I can’t constantly keep looking at my phone trying to figure out how to get back to the spot before it skipped ahead. Maybe playing through the website is more reliable, but there is no forward or rewind feature that I saw. App screen shots show that this app appropriately fills the iPhone X display. The app does not. Looks like it hasn’t been redesigned since the iPhone 4 came out. Still buggy, too. CarPlay support would be a fantastic addition. The playback features are very weak and app offers very little control over play modes. Difficult to go back and delays between controls and what you’re hearing. Plus, I unknowingly got hit for a monthly subscription fee but book pricing is only a couple of dollars better than others. Monthly was my fault for not reading fine print but they’re sneaky and I don’t like sneaky (see Luminosity). And you can’t cancel in app, you have to go log in on their website. Sneaky sneaky, make it hard, don’t like that. I have a long commute and I live listening to audiobooks. This app allows me to download them and listen to them as I go.